Click HERE to see other Europe travelogues! Leaving Budapest behind, we travelled to Vienna – which is located near the borders of Hungary. Vienna is the capital of Republic of Austria and is often known as “The City of Dreams” as it was home to Professor Sigmund Freud, one of the world’s greatest interpreters of dreams. Vienna is rated as the second best city to live in, according to the 2011 Global Livability Survey – and I have to agree I wouldn’t mind a single bit (in fact, I probably won’t mind living in most of the Europe countries I’ve been too… haha). There’s so many things to see (and eat of course!) – majestic palaces, beautiful parks and amazing food. Do you know Vienna is where the famous cake, Sachertorte, is from? And of course, we wouldn’t want to forget the Apfelstrudel – the traditional Viennese apple strudel! The first thing we went to visit when we reached Vienna was to go to the famous Schönbrunn Palace. It was not only huge, but grand and really gorgeous. The palace tour is pretty amazing, but what’s outside the palace is much more stunning. I’d bore you if I tell you the history of this palace, but it’s a really must go if you’re in Vienna (it’s of course one of the top destinations in Vienna). 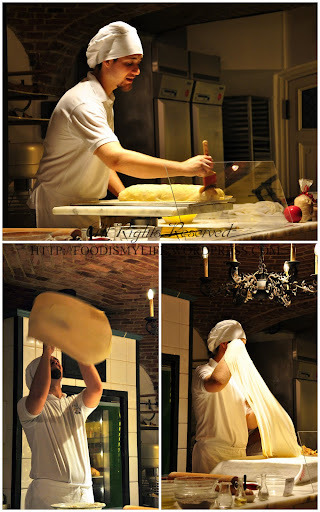 The demo was held at the café in the Palace and the pastries really make my mouth water… They are so beautiful! The built mazes in the palace grounds and it was fun navigating our way through the maze. Reminds me of Harry Potter and the Goblet of Fire. This is one of the gardens nearer to the Palace (can’t remember the name! ), but they have a very beautiful sheltered walkway. At the foot of a hill sits a majestic fountain which was completed in 1780. The size of gardens represented the ruler’s status and hence the design of a garden is always closely related to the architecture of the palace. Most of the times, they will built the garden to be symmetrical. The Privy Garden has tall hedges of plants planted around this garden, sheltering the garden from wind. Hence, we are able to see a really beautiful display of flowers and plants. After several hours, we started to climb the hill towards the Gloriette. It’s a bit of a climb, but the view we were rewarded was well worth it. Built in 1775, the Gloriette was the design of Johann Ferdinand Hetzendorf von Hohenberg (what a long name!). The middle section was built in the form a triumphal arch. On the top sits an imperial eagle perched on top of a globe with multiple trophies adorning all around the Gloriette. It has a flat roof which serves as a viewing platform. After spending almost half a day at the Schönbrunn Palace, we left and went to visit Karlskirche, a very beautiful church that was built by an emperor in 1715 in thanks for an answered prayer. There was a huge man-made pond right in front of the church and we almost caught the full reflection of the church. This church has a very unique design as it combines different elements of architectural style. The dome and the towers at the side are of Viennese Baroque designs; the two columns have the essence of ancient Rome while the portico (where the entrance is) bears a striking resemblance to Greece’s Parthenon (though in a much smaller scale). A visit to Vienna wouldn’t be complete with a visit to Wiener Staatsoper. I would love to go back to Vienna just to watch an opera here, apparently the tickets are really hard to acquire! I love the parks in Europe – it’s not just about trees and benches, there are a lot of things to see in these parks. Stadtpark is the largest public park in Vienna buit by the city council mainly between 1858 and 1862. In the background there’s the Kursalon, which is originally a spa pavillion, but because it Johann Strauss II performed there, it is now a popular venue for concerts. A Waltz music lover will definitely know Johann Strauss. There’s a memorial of Johann Strauss in Stadtpark which is one of the most known and photographed statue in Vienna. Hofburg Palace is currently serving as the official winter residence of the President of Austria. It once housed some of the most powerful people in Austrian history. In the middle is the statue of Prince Eugene of Savoy, an Austrian military leader. This building is a town hall built between 1872 and 1883 which serves as the seats for both the mayor and the city council of Vienna. The next day, we visited Stephansdom, a gothic cathedral the symbolizes Vienna’s freedom due to it surviving through many wars. Built in 1147 AD, it has a unique diamond-patterend tiled roof that was added in 1952. When we entered the cathedral, we were greeted with a colourful display of lights. We were not sure what’s the event that happened in the cathedral, but different coloured cellophane papers / cloths (can’t remember which) were draped over windows to create this spectacular view. The Anchor Clock is situated on the oldest square of Vienna – Hoher Markt and was constructed between 1911 and 1917. The clock actually forms a bridge between two buildings, both belonging to Anker Insurance Company. What’s interesting about this clock is that twelve historical figures or pair of figures will “walk” across the bridge in the course of 12 hours. Constructed in 2000, this memorial was built to honour the Austrian Jews who died in the Holocaust. It was designed as library shelves to represent the scholarly tradition of the People of the Book. As we had extra time on hand on the second day, we headed to Belvedere, another palace in Vienna. There are two Baroque palaces built on each end – the Upper and Lower Belvedere. It wasn’t as grand as the Schönbrunn Palace, but it’s still a very pretty place. There was a gentle slope in between the two palaces, so it’s a very relaxing walk while enjoying the views of the place. The Upper Belvedere houses the Belvedere museum but X and I weren’t very interested in it, so we just walked around the grounds. Our last stop in Vienna was Wiener Prater. Reputed as one of the oldest Theme Park in the world, Wiener Prater is a very popular amusement park that operates mainly from 15 March – 31 October every year. Even if it’s closed during the winter, visiters can still walk through the closed park. There’s no entrance fee to enter the park, one just have to pay for the price of the ride that you want to go for, and it ranges from about 1 euro to 10 euro per ride per person. The more thrilling / popular the ride, the more likely it’ll be more expensive. One of the most famous rides as it can oversee the whole of Vienna, I remember it’s about 8 euro to go on to the ferris wheel. They even have water rides! This is actually a pretty cool ride – it is a really tall pole with swinging chairs that brings you up to a height where you can oversee Vienna. 5 euro! We took a long time in deciding what to ride on, in the end we settled for Boomerang, a roller coaster ride which costs 5 euro each. It was one of the most thrilling rides I’ve ever experienced in my entire life! And now it’s on to the food in Vienna! 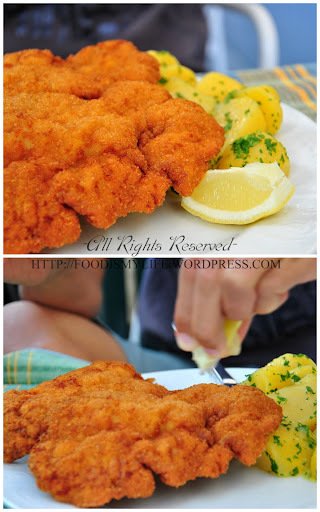 I’m soooo excited and blogging about these food is really making me hungry! Sachertorte is a chocolate cake invented by Franz Sacher in 1832. One of the most famous Vienna specialties, this original cake can be bought in Hotel Sacher (dining there is more expensive so we simply bought a slice and ate it at Stadtpark. Dense and moist with a thin layer of apricot jam in the middle and a dark chocolate icing on top, this cake is not too verly sweet. However, this cake it’s a little bit on the dry side, from what I read, this cake is normally served with whipped cream to counter the “dryness”. I seriously can’t pronounce the name of this Sandwich shop… but it’s a Viennese classic. Located on Dorotheergasse 1, they serve miniature sandwiches and have a lot of different flavours. They even have miniature beers! All we have to do is just point out the sandwich that we wanted. It’s really busy during lunch hour – and it’s just so hard to decide on which sandwich to get! I wish I have the ability to just buy one of each… heh. 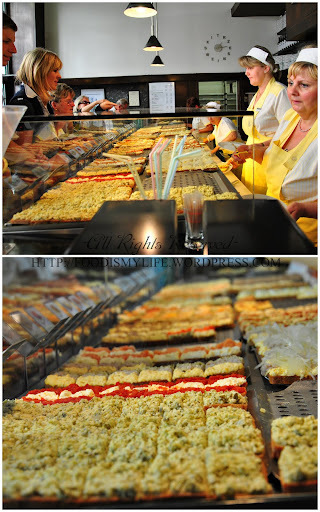 We also bought pastries when we were walking around Vienna, and they all taste pretty darn good! Gelato to cool off the heat! Tucked away in a corner at Gluckgasse 5, this restaurant was recommended to try authentic Vienna cuisine. We popped by there for a late lunch. I read online that it was closed on weekends and it gets really crowded during lunch. I grabbed a quick fix of the goulash soup. I wouldn’t say it’s the best, but it is pretty good with lots of goodies inside the soup. This restaurant is reputed to serve traditional Viennese food and it is located very near the amusement park, so it’s good to pop by there for dinner after visiting the park. Though the food was not bad, I find the place a little bit touristy, and I remembered we didn’t have a very good experience dining there because the service was quite slow. 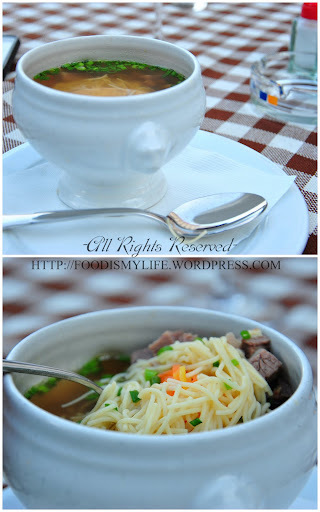 A really light and clear soup with noodles, beef and vegetables. Pretty hearty and it’s a good appetizer. The dumpling was massive but we weren’t very fond of it. I guess it wasn’t our type of food. The pork neck was pretty salty but the meat was tender and nice. The serving size was quite big, and the steak was quite tender. I like the onions as it’s really crispy! I’m from Vienna and it’s really great to read about a touristic view – I always wonder what it’s like to see it for the first time when I walk around in the city. Did you know that Trzesniewski’s slogan is “Die unaussprechlich guten Brötchen” which means “The unpronounceable good sandwiches”? – That’s why it’s really funny that you write you can’t pronounce it. Also, I can tell you: The original Sacher Torte is really dry. That’s why most Viennese people (me included) don’t like it. Most of the time, we recommend the Sacher Torte at “Demel”, another famous Viennese pastry shop. It tastes great there – But it’s not the original one.